Business owners and property managers know how stressful it can be to deal with an unexpected plumbing issue. If your company experiences a plumbing problem that prevents customers from using the restrooms — or if the issue is severe enough that you must temporarily close your business or rehome tenants — choose a plumbing repair company you can trust to provide prompt repairs whenever you need them most. Sunshine Plumbing and Gas will respond quickly to fix your plumbing problems in order to minimize any downtime. Our technicians are licensed and insured, so your commercial property gets the highest quality plumbing services. Whether you need preventative maintenance, a system inspection, or emergency repairs, we are ready to provide you with top-quality service. Our company is so dedicated to the happiness of our customers that we offer a guarantee on all of our materials and services. For efficient and effective plumbing, contact us today. What Commercial Plumbing Services Do You Provide? From restaurants and retail properties to office buildings and apartments, our team is trained to effectively identify the cause of your plumbing problem and provide solutions aimed at directly treating the source — no commercial property is too big or too small for us to service. Plumbing catastrophes can happen at any time — emergencies don’t wait until after business hours or when it’s convenient. While no plumbing emergency is ever really convenient, the cost to repair any damage, the downtime from regular business hours, and potential loss of profits can make an unexpected plumbing problem even more problematic. When left to fester, small plumbing problems can quickly become costly and time-consuming plumbing disasters. Time is of the essence with plumbing emergencies. If disaster strikes your commercial property, Sunshine Plumbing and Gas is your first call for emergency plumbing solutions, 24 hours a day, 7 days a week. During new construction, it is integral that you invest in an efficient and dependable plumbing system. When you are looking for a reliable commercial plumber to complete a new construction job, be sure to choose one who can effectively install the plumbing, without delaying the projects’ deadline. We will help you design the best systems that can withstand frequent customer use for years of problem-free plumbing within your commercial structure. Our technicians can ensure every detail of the new plumbing is adequately designed, installed, and tested for optimal performance. Should the new building experience common plumbing issues, such as a clogged toilet drain, you can count on us to quickly restore proper function to your system. If you find that your commercial plumbing system requires frequent repairs or the plumbing system hasn’t been replaced in years, contact Sunshine Plumbing and Gas. We are committed to installing the highest quality products to your commercial structure that will adequately withstand your business’ plumbing demands. When you choose our plumbing services, you receive the assurance that your system will function effectively. What’s more, we provide thorough maintenance and prompt plumbing repairs for reliable system function. It is important that you remain aware of any problems with your plumbing system. Sometimes, smaller issues may be symptomatic of more extensive problems that require a professional Ocala plumber to repair. Common indications of plumbing complications include unusual noises in pipes, blockages in sinks or toilets, and slow-draining pipes. One of our technicians will respond promptly in order to diagnose the cause of the problem and perform high-quality repairs. We provide all-encompassing plumbing services to commercial properties of all size and type, including water heater repairs and leaking faucets repairs. Running a restaurant is a full-time job — business owners shouldn’t have to worry about the plumbing system failing in their commercial property. Restaurants rely on properly functioning plumbing to serve customers, prepare food, sanitize cooking equipment, and more. Should the dishwasher fail to function or the pipes become clogged, it won’t be long before a business starts to lose business and money. What’s more, small issues in the system can quickly develop into complex plumbing disasters, keeping customers out of your restaurant for an even greater amount of time. Keep your regular business hours with our restaurant plumbing services. We will work to ensure each component functions as it should, so you can focus on your business. 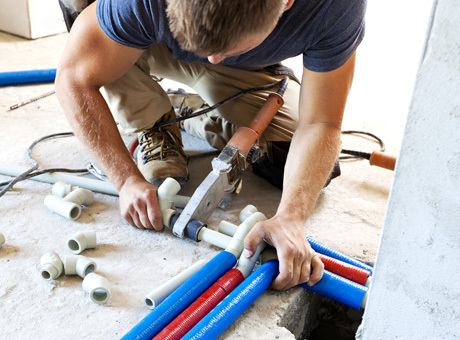 A business’ plumbing system may appear similar to that of a residential property, but commercial plumbing typically experiences more extensive use than the plumbing in a home. Because of these demands, the piping can quickly become problematic. If your pipes contaminate the water supply, have deteriorated over time, or would be more cost-effective to replace than to repair, contact us for expert piping services. Our team can replace your plumbing system by utilizing expert techniques and high quality products.